As a Consultant for the State Library of Iowa, I routinely work with small and rural libraries. In fact, Iowa has 544 public libraries, with 476 of those libraries serving communities of less than 10,000 people. 47% of those 544 libraries are in towns with less than 1,000 people. These libraries are not only located in small-population towns, but they also have small facilities, small budgets and in many cases, very small staff rosters (sometimes with the Director as the only staff member). Small, however, does not mean less! Throughout the state, our public libraries are doing amazing things to serve their populations, and many of the small-library directors have become quite creative at making “big ideas” work in their small environments. 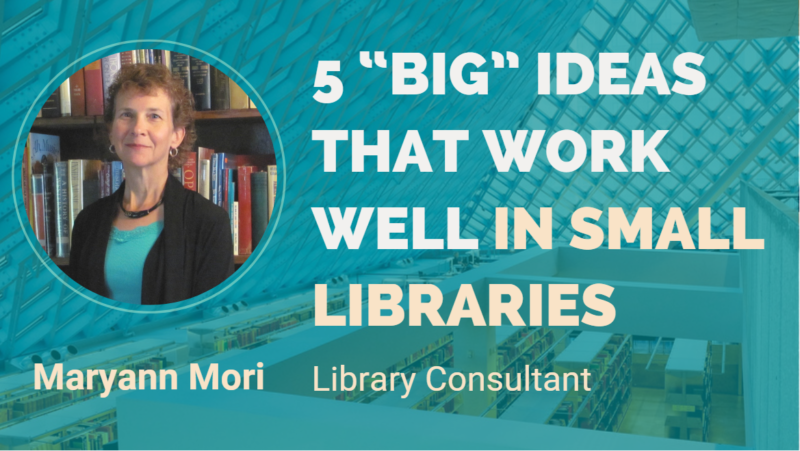 Our #publiclibraries are doing amazing things to serve their populations, and many of the small-library directors have become quite creative at making “big ideas” work in their small environments. Noticing some of the wonderful ways small libraries were creatively serving their communities, I developed a presentation titled “Size Doesn’t Matter: Transforming Big Ideas into Small Library Environments,” which I originally presented statewide for the State Library of Iowa, and later at the 2018 conference of the Association of Rural and Small Libraries (ARSL). The response from both presentations was overwhelming. Waukee Public Library sets out a small display table with a few children’s books in a basket (picture books, easy readers and board books) – books are all centered on a theme. 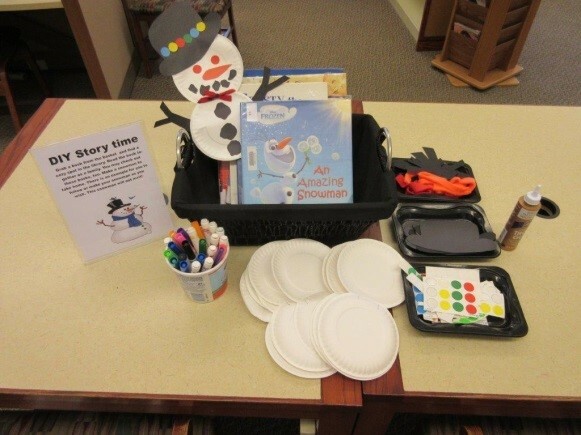 The display includes prepared craft materials with a completed example, and a stand-up note instructing parents and caregivers how to conduct their own Storytime with their little one. Library staff can provide a literature-based activity even on days when there is no staff available to present a formal Storytime program. Imagine the father being the Storytime presenter! Kids and their families enjoy the one-on-one time, library staff can provide a literature-based activity even on days when there is no staff available to present a formal Storytime program, and interest in additional books on the chosen theme is piqued (which can lead to additional circulation). Even small libraries can have circulating “things” that go beyond traditional circulating items including things such as punch bowls, sewing machines, or sports equipment. Even small #libraries can have circulating “things” that go beyond traditional circulating items including things such as punch bowls, sewing machines, or sports equipment. 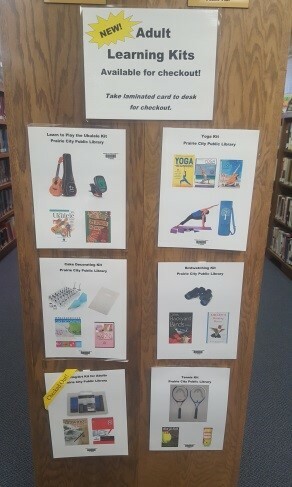 Prairie City Public Library has several “adult learning kits” that regularly circulate. The kits vary from sports (disc golf) to exercise (yoga) to crafting (cake decorating) and music (ukulele with method books). Patrons simply select the large “card” that lists the items in the kit, bring it to the check-out desk and receive the kit in a bag. Instead of envying the fabulous kids’ or teen space at the “big” library in your county, try gleaning a few things from their example and incorporating them into your smaller space. Maybe you adopt the same color scheme or purchase just one of the cool chairs. Perhaps you can order the same rug or incorporate the nifty chalk paint to turn a wall into a graffiti spot. Carlisle Public Library which has just 3600 square feet in its library, turned one side of the library into a teen area simply by putting shelves on wheels and using the mobile shelving unit as a “wall” to indicate the teen area. The shelves can easily be moved to open up space when additional seating space is required for programs. Waukee Public Library took donated ceiling tiles, purchased inexpensive paints, and allowed teens to paint their own ceiling tile. The tiles were then installed in a corner of the library to indicate the teen space. The total cost of transforming the area was less than $50 and it gave teens a sense of ownership in the library too. As the Director of Slater Public Library has said, “Makerspace is just a fancy word for craft area.” Don’t think you need a 3-D printer or other larger, expensive equipment to develop a makerspace. Once a month, Slater Public Library moves some of its furniture out of the way, sets up folding tables, brings out its Cri-cut machine as well as a few bins of materials, and hosts a card-making and scrapbooking group. Voila! Instant makerspace! The library also purchased small robotics, Lego and circuitry sets as part of its makerspace concept. The kits are individually housed in clear plastic shoeboxes, cataloged, and checked out to young people or families to use at the library. The kits neatly fit on a small shelf behind the library’s circulation desk where they are visible to the public, but not at risk of theft. One of the best and easiest ways to make your small library much bigger is to collaborate with other libraries in your area. In Iowa, this is often done among libraries within the same county. In Greene County, a very rural area with 6 predominantly tiny libraries, collaborative efforts allow the libraries to host an annual Toddler Fest (a huge event with large attendance and community partnerships), a county-wide “read” (a selected book with speakers and activities scheduled throughout the county), a summer reading guest artist (unusual presenter that the individual libraries could never afford on their own), and a teen movie night (a preview event of an up-and-coming release of a movie based on a book). These are only a few examples of the wonderfully creative ways Iowa small and rural libraries are serving their communities in big ways! I never cease to be amazed at the creativity and dedication these small libraries demonstrate in their services to their communities. Maryann Mori has presented on a variety of topics at several national library conferences including ALA (2018, 2009, 2008), ARSL (2018, 2014, 2013), ALSC (2012), PLA (2010), and The Internet Librarian (2007). She has also published numerous times in professional journals and books, where she wrote about topics such as teen services, library volunteers, job-related stress, and programming. Formerly Teen Specialist Librarian for the Evansville Vanderburgh Public Library (Indiana) and Director of Waukee Public Library (Iowa), Mori is currently a library consultant for the State Library of Iowa. She completed her MSLIS from the University of Illinois in 2006.